Casement windows, by far the most popular British window style, are available in a multitude of options, perfect for any home. Casement windows are also an ideal choice for direct timber replacement. The wide selection we have offer enables you to choose the style that is perfect for you. Choose top or side openers or incorporate both. Alternatively, have you ever considered a Bow or Bay window or considered stained or patterned glass? Leaded or Georgian panes? The choice is almost limitless. Our windows are available with two distinctive styles of frame and beading. The chamfered option is a contemporary design, while Ovolo sculptured beading gives a more traditional, decorative finish to your window. Both options are available across our entire range. You can even ‘mix and match’ chamfered and Ovolo frames to create a unique style for your home. All our window styles are available in a variety of colours including white and two woodgrain finishes, Rosewood and Golden Oak. Manufactured with specially formulated resins and stabilisers to ensure that your windows do not discolour over time. The vertical sliding sash windows let you achieve a classic, distinctive look. with all the high-performance, low maintenance benefits of UPVC. These windows are styling of the Georgian era, with two sliding sashes, decorative horns and sculpted frames. Plus, our unique sculpted Georgian bars and fixings subtly enhance aesthetics, adding even more character. These simple and functional casement windows are ideal for all types of property. It is the most popular and commonly used style of window in the UK. Our products can be either top-hung opening or side-hung opening to suit your requirements, giving you excellent ventilation and security. If your home features a traditional bay or more modern bow-style, we can create high-performance, draught-free and secure windows tailored to you. Bay and bow windows open your room, creating the feeling of space and light. In addition, we can enhance this effect by installing slim-framed windows that maximise your glazing area and give your home more natural light. This sophisticated window design is becoming increasingly popular. It combines the benefits of a large area of glass with ease of cleaning and excellent ventilation. The innovative tilt-and-turn mechanism enables it to be opened inwards from the top for effective ventilation or from the side for safe and easy cleaning from within your home. Tilt and Turn windows give you an easy cleaning facility of being inward opening, allowing both sides of the glass to be cleaned from inside your property. Sovereign Home Improvements and their dedicated team of experts have over 30 years combined experience at fitting in woindows in Southend, windowa in Grays, windows in Basildon, Windows in Romford and windows in Brentwood as well as many other towns in the county. 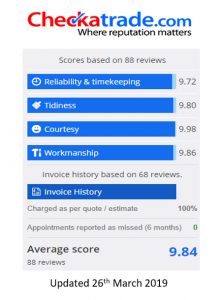 The team take great pride in their work which has been born out by the number of positive and extremely high customer reviews on our website, Google review page, and associated sites such as CheckATrade.com and many others. As a family business, we recognise that giving our customer the best possible advice is paramount to any business. Therefore, when we first meet to discuss your requirements, we take the time to listen very carefully to the look you are wishing to create and as such make our recommendations according to your brief, and not accordingly to our profit margins. Yes, that’s right, a building company with a conscience…. we want to come back time and time again to use our services time and time again. We love our work and we look forward to making many more homes in Essex Better!